The Shakespeare Slider Snap Swivel is similar to zip/slider booms except it has a small plastic oval on the end to thread onto your mainline as opposed to the plastic T shape. 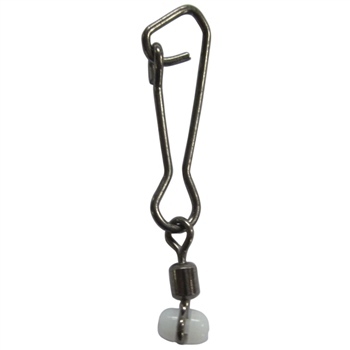 This swivel is ideally suited for making running ledger rigs and other similar styles of rigs. You can use the large clip/snap for attaching a lead weight. This rig set up will help reduce tangles, give better bait presentation and will cause minimal abrasion when running against your mainline. The Shakespeare Slider Snap Swivels are supplied in different sizes with 10 provided per pack.